New technology has made it easy to get the smile of your dreams. If you’ve been dealing with dental issues related to gapped, crowded, or otherwise misaligned teeth, Dr. Sakeena can help. At Sienna Smiles, we offer patients the benefits of a straight smile without the embarrassment and hassle of traditional braces; our patients come to us to enjoy the benefits of Invisalign® in Missouri City. To begin your Invisalign® treatment at our Missouri City dental office, Dr. Sakeena will take an impression of your teeth and send this information to the Invisalign® laboratory, where your clear aligners are created. Aligners are then worn on a schedule set by Dr. Sakeena; a full course of treatment with clear braces typically lasts only 12-14 months. Teeth that are too close together make easy hiding spots for the harmful build-up of plaque and bacteria. Because these tight spaces are difficult to clean between with brushes and floss, this bacteria can contribute to periodontal disease and tooth decay. Straightening out misaligned teeth makes it easier to keep your smile clean and healthy, as well as aesthetically pleasing. Dr. Sakeena has worked to make her dental office a place where patients can receive personalized care that is tailored to meet their specific oral health needs. She keeps up-to-date on the latest advancements in comfortable dental care, which is why she is happy to offer the benefits of Invisalign® to her Missouri City dental patients. 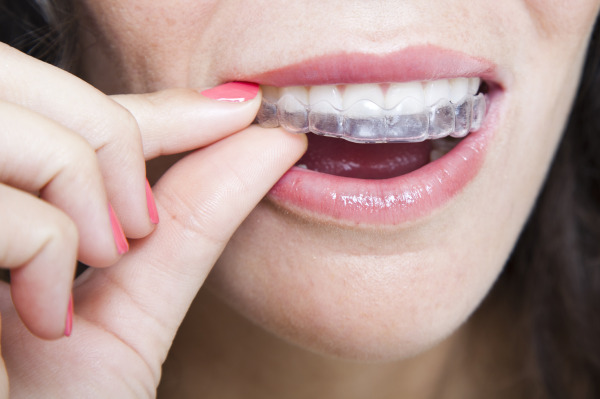 Your clear aligner trays snap into place and instantly disappear on your teeth; you can feel confident knowing that you aren’t flashing a mouth full of metal at your friends and co-workers. Because Invisalign® is removable, you can also take the tray out during meals, routine brushing and flossing, and even important events and photo opportunities. Invisalign® does not use brackets and wires to move your teeth into place, so you won’t have to worry about your treatment bothering sensitive tissue on the inside of your mouth. We want to help you on your journey to a better smile. Dr. Sakeena and her dental team are here to answer any questions you have about the process and cost of getting Invisalign® in Missouri City. Call our friendly staff today at 281-778-3200 to schedule an appointment.